Touch-Free Soap Dispenser Helps To Minimize The Risk Of Cross-Contamination During Handwashing And Meets Ada Guidelines. Extending Less Than 4" From The Wall, Dial Duo Touch-Free Dispenser Automatically Dispenses A 0.5ml Metered Dose Per Activation (Up To 2500 Handwashes). Translucent Backplate Allows Easy Viewing Of The Soap Level. Front, Clear Window Identifies The Kind Of Refill Inside. The 1.25 Liter Refill Cartridges (Sold Separately) Are Easy To Load And Change Out. Collapsing Refill Design Reduces Maintenance By 25 Percent And Minimizes Waste. The Ratchet Closure Prevents Bulk Filling. Refills Also Feature Unique Pump Tips And Color-Coordinated Closures. 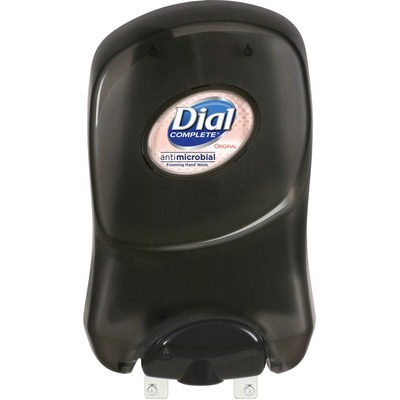 Durable Dispenser Is Made Of Heavy-Duty Abs Plastic. The Locking Mechanism On The Dispenser Helps Prevent Tampering And Vandalism. Dispenser Also Includes Both Screw-Mount Hardware And An Adhesive-Back Mount Option. Touch-Free Battery Life Lasts Up To Three Years. The Dispenser Uses Four D Batteries (Sold Separately)..
Touch-Free Soap Dispenser Helps To Minimize The Risk Of Cross-Contamination During Handwashing And Meets Ada Guidelines. Extending Less Than 4" From The Wall, Dial Duo Touch-Free Dispenser Automatically Dispenses A 0.5ml Metered Dose Per Activation (Up To 2500 Handwashes). Translucent Backplate Allows Easy Viewing Of The Soap Level. Front, Clear Window Identifies The Kind Of Refill Inside. The 1.25 Liter Refill Cartridges (Sold Separately) Are Easy To Load And Change Out. Collapsing Refill Design Reduces Maintenance By 25 Percent And Minimizes Waste. The Ratchet Closure Prevents Bulk Filling. Refills Also Feature Unique Pump Tips And Color-Coordinated Closures. Durable Dispenser Is Made Of Heavy-Duty Abs Plastic. The Locking Mechanism On The Dispenser Helps Prevent Tampering And Vandalism. Dispenser Also Includes Both Screw-Mount Hardware And An Adhesive-Back Mount Option. Touch-Free Battery Life Lasts Up To Three Years. The Dispenser Uses Four D Batteries (Sold Separately).